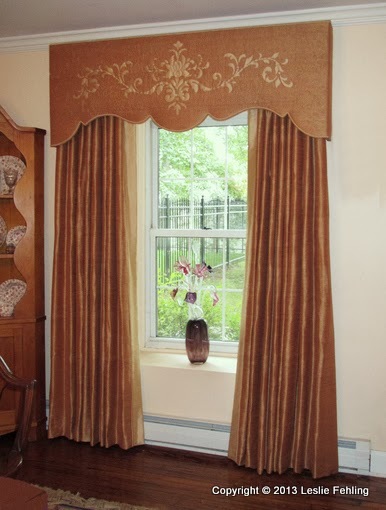 The dining room of an historic home in Morgantown, West Virginia, was transformed with elegant new window treatments and slipcovers, all embellished with custom designed applique. The floor length drapery panels of copper colored dupioni silk were lined and interlined, giving them a plush look and feel. (The interlining also adds to the insulating value of the draperies.) Three-inch wide banding in a warm flax color highlights the leading edge of the draperies and is accented with double welt cord. Lush and beautiful as the draperies may be, the upholstered cornice mounted above the draperies is the real show-stopper. Quilting, applique, double welt, and an intricate lower edge profile combine to elevate this window treatment to a work of art. I designed the applique to complement the shape of the cornice, using a variety of historical textile designs as my inspiration. The silk applique was applied to the background using a fusible material which can be sewn through, allowing me to quilt extra detail lines in the floral motifs. Behind the silk fabric is a layer of thick polyester quilt batting which is backed with cotton drapery lining. 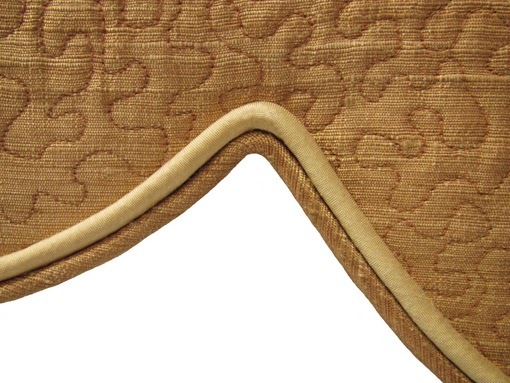 Machine quilting through all the layers is what gives this cornice its unusual texture and dimension. 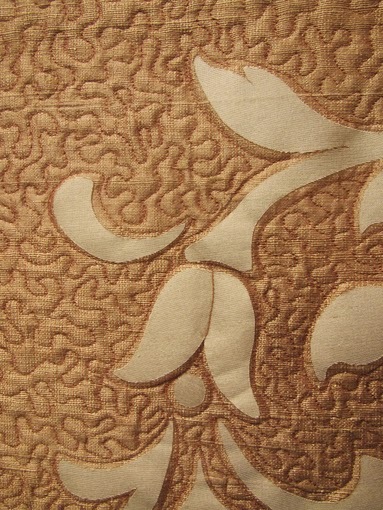 The meandering quilting used in the areas surrounding the applique is called stippling. It was done on my old reliable Bernina 1630 and is completely hand-guided. More than twenty hours and 1000 yards of thread went into the quilting of this cornice. Sometimes, after working on it into the evening, I felt like I was still stippling when I closed my eyes to sleep! 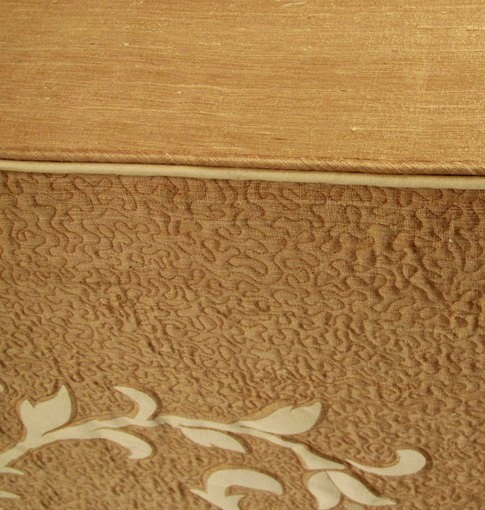 It's all about the details when designing custom window treatments. 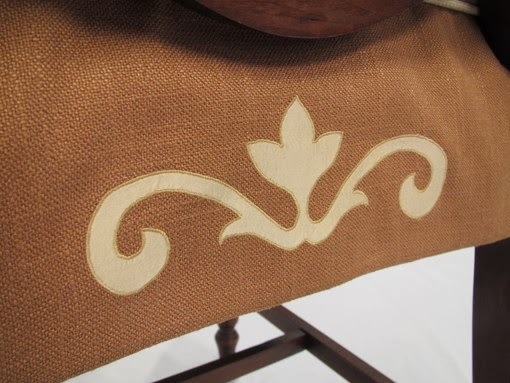 In this project, rather than using a simple matching welt cord on the shaped lower edge, I added an extra line of piping to echo the color of the floral applique design. It's an understated detail that really gives a custom look. Even the top edge at the dust board is double-welted. 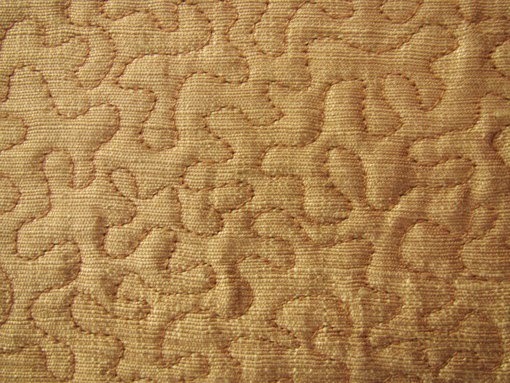 The same detailing is repeated on the leading edge banding on the draperies. In addition to a new window treatment, this dining room was updated in a couple of other ways. A set of antique chairs were dressed up with new skirted cushions, designed to complement the floral applique on the cornice. Since the back of a dining room chair is what shows when it's pushed under the table, that's where I chose to feature an eye-catching applique. The design borrows a few of the simpler elements from the cornice applique - just a little something to add interest to the eight chairs surrounding the table. 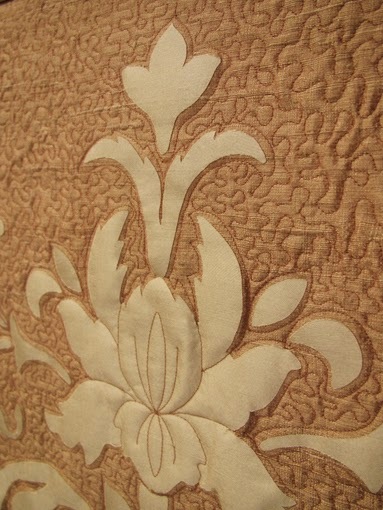 A rust-colored linen blend was used for the body of the slipcover and flax-colored silk for the applique. A narrow satin stitch secures the edges of the silk, ensuring that the applique will stand up to dry cleaning. The stitching was all done on my Bernina 1630, guided by hand. 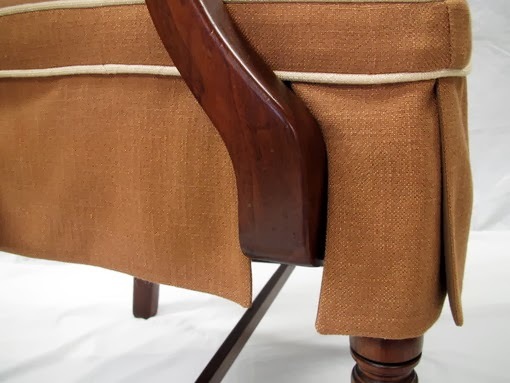 Dining room arm chair slipcovers are probably the most difficult and time-consuming items I make in my custom sewing business. Making the pattern is a tedious process. 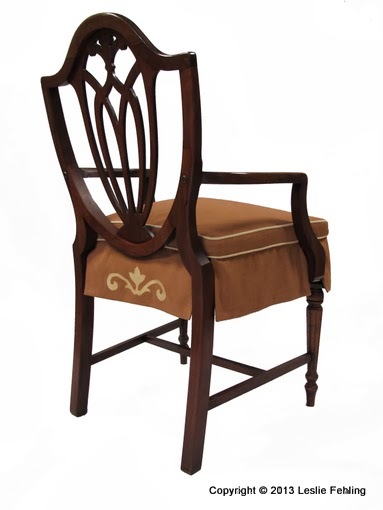 The cover must be shaped around all the legs without allowing the old upholstery to show, and the fit must be perfect. It takes time and patience, and a bit of trial and error, to achieve a fit that satisfies me, but it's so gratifying when it all comes together in the end. 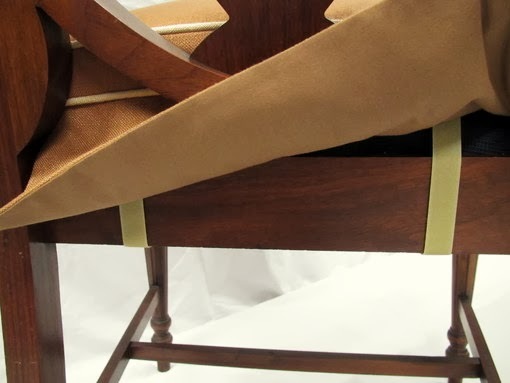 To keep the slipcover cushion anchored in place, I attach loop Velcro to the slipcover itself, and staple hook Velcro to the underside of the chair frame where it's hidden from view. It allows for easy installation and removal, and everything stays where it's supposed to be. The final touch in this revamped dining room was a simple table runner which I made to coordinate with the chair slipcovers. 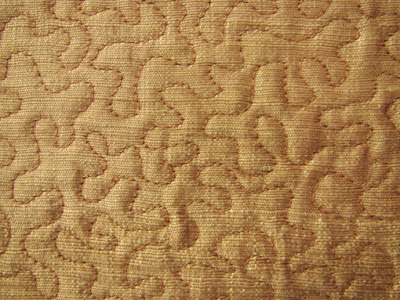 It features the same linen and silk fabrics and an applique design that's a variation of the one used on the slipcover skirt. The last step in this makeover will be to find a new tablecloth to complement the warm colors of the table runner. My client loves the new look of her dining room, especially the creative touches that make it truly unique. Have you been itching to try out a Zeta sketchbook after reading my last few posts? If you've already commented on any of the Zeta posts, you're automatically entered! Three names will be drawn at random from all entrants. The first and second names drawn will receive a 7x7 Zeta. The third will receive a 6x8. Winners will be announced August 21, 2013, here on my blog. My sketch of the Pensacola Beach water tower graces the label of every package of DeLuna Coffee Company's "Beachin' Blend" coffee. The dark French roast will keep you wide awake for hours of drawing and painting in your new Zeta sketchbook! Leave a comment to be entered to win! 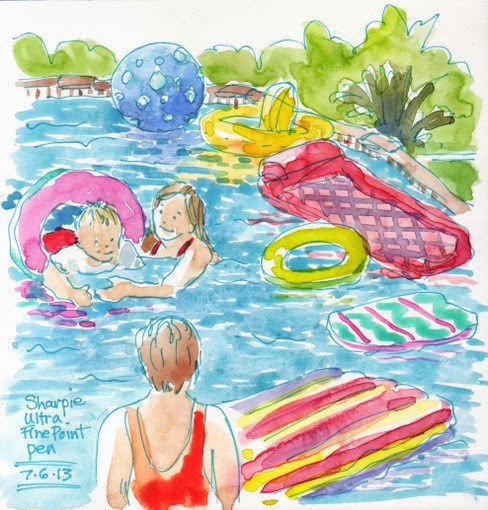 After spending some time getting to know my new Zeta sketchbook from Stillman & Birn, I took it along on a family vacation to Maine. (To see Parts 1 & 2 of my review, click here and here.) Although I packed several sketchbooks for the two-week trip, I found myself reaching for the Zeta more often than any of the others. I really like how my pens glide across that smooth paper, and I'm loving it for watercolor. 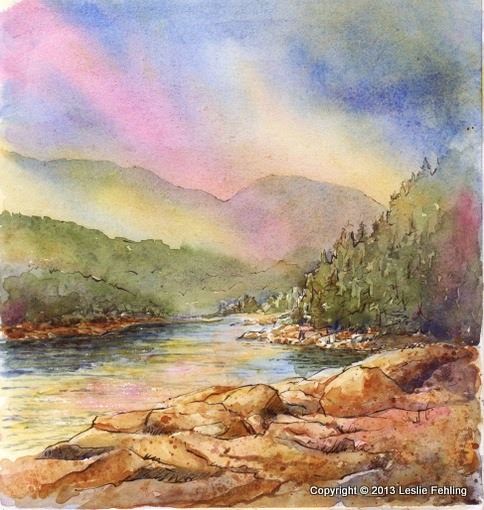 To paint the sketch, I wet the entire page then dropped in rose violet, ultramarine blue, and cadmium yellow light, allowing the colors to merge a bit, and tilting the sketchbook to direct the flow of the washes on the smooth Zeta paper. I like how that initial wash helps to tie the parts of the painting together through color repetition. Stone Barn Farm, built in 1820, was just up the road from where we were staying. 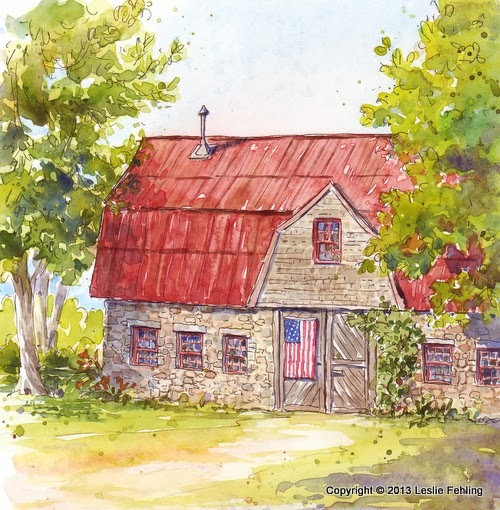 The historic old barn was just begging to be painted. 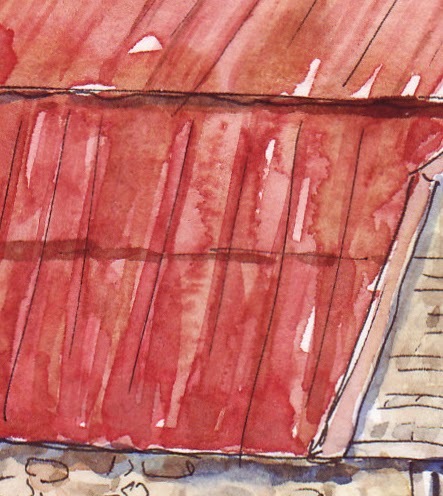 I used the wet-in-wet "blooming" effect of watercolors to represent rusty patches on the the old metal roof of the barn. And I was able to achieve some nice dry brush edges in the foreground, even though it's a bit challenging to do on the Zeta paper. Bar Harbor is a fun town with cute shops, great restaurants, and a village green complete with bandstand. 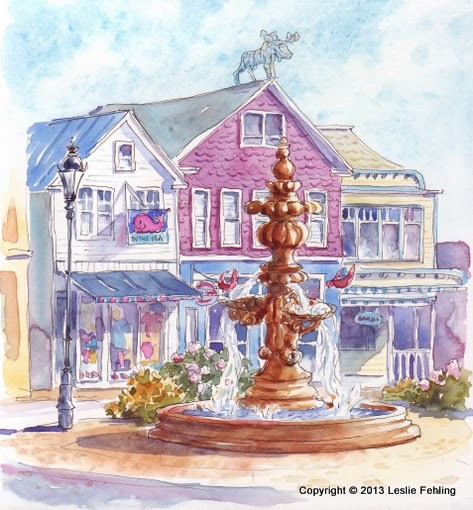 The main street leads downhill to a picturesque harbor area, where I sketched this fountain. And, yes, that's a moose on top of the pink building! 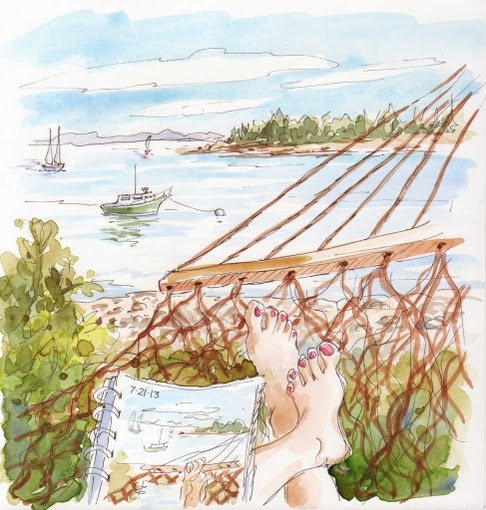 This next sketch is kind of silly, but it shows how I was feeling that day - relaxed and mellow, swinging in a hammock under a shady tree, looking out at the water, watching the sailboats go by...wishing I could stay there forever! 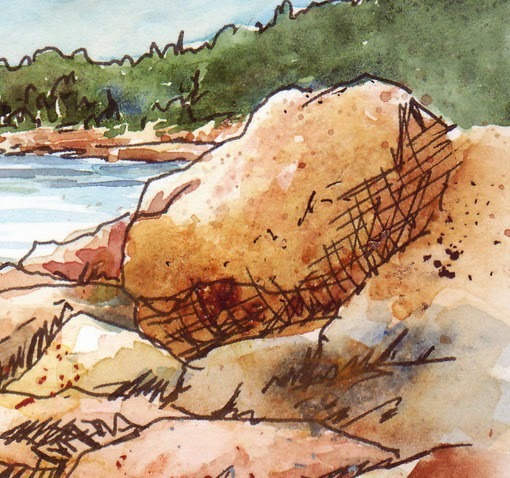 On this sketch of Otter Point in Acadia National Park, I played around with many of the texturizing techniques from my sample pages. I spritzed alcohol, sprinkled salt, and did plenty of spattering. 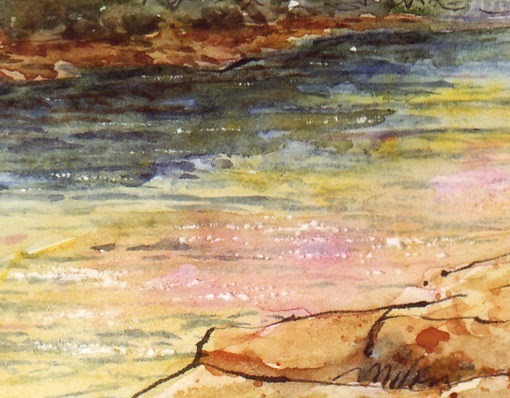 The effects of the alcohol and salt are subtle here, because my paint color on the sunlit rocks wasn't very intense. Spattering paint with my round brush and with a screen worked much better in this case. 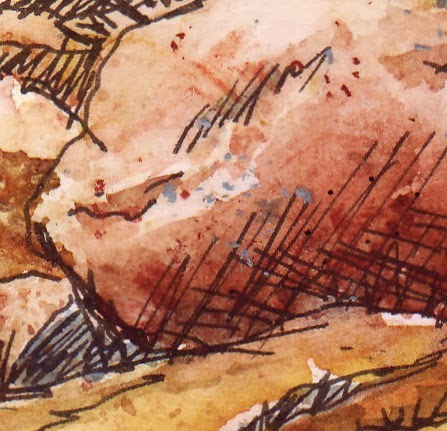 I even scattered shavings of watercolor pencil "lead" into the wet paint to add texture to the rocks. 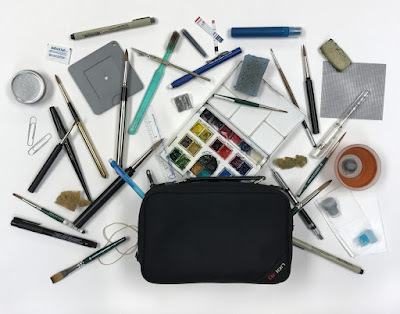 The prolonged drying time of the Zeta paper allows a more leisurely approach to adding salt, alcohol, watercolor pencil shavings, or additional paint colors. Although I began my Zeta experience feeling like I had no control over what the paint was doing on the page, I gradually learned how to control it to get the effect I wanted. 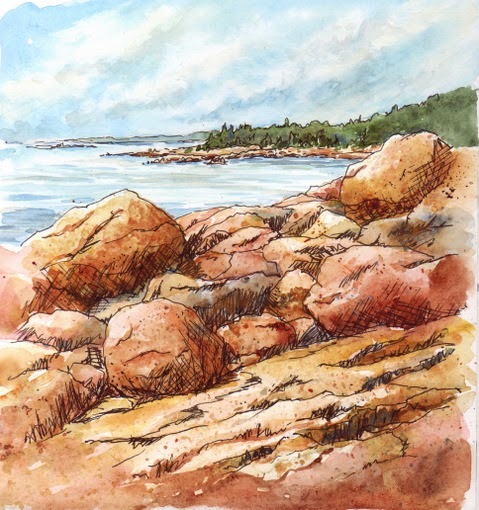 In the sky of the Otter Point sketch, I washed on cerulean blue, then lifted out the clouds with a damp tissue, and, after that had dried, added a light overglaze of pale gray. Layering wet-on-dry works just fine when you do it with a light touch. But Maine wasn't all pine trees and rocky coastline. We also visited Thuya Gardens, tucked away on a hillside overlooking Northeast Harbor. The flowers were amazing, inspiring, and at least twice the size of similar plants here at home. 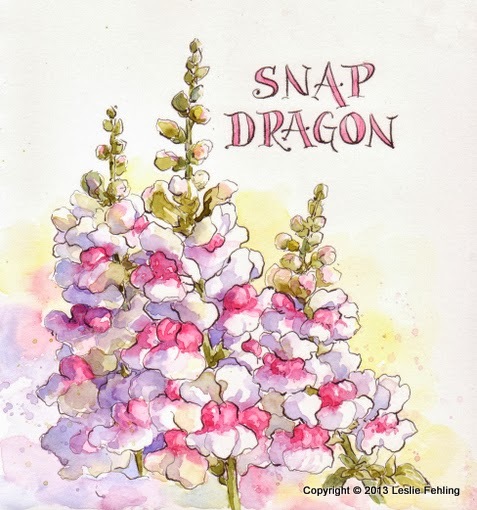 The snapdragons were gorgeous! Learning to paint on the Zeta paper took some practice. I'm glad I didn't let my first panicky experience discourage me from continuing. In just twenty pages of sketches, I learned how to better handle the slick paper and capitalize on its unique qualities. And I had a lot of fun just playing around. I hope my experiments have encouraged you to "test drive" a Zeta. 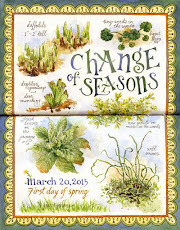 After playing around with Stillman and Birn's new Zeta series sketchbooks for a few weeks (see PART 1 of my review here), I decided it might be worthwhile to do a few pages of test samples to see how various watercolor techniques work on the Zeta paper. 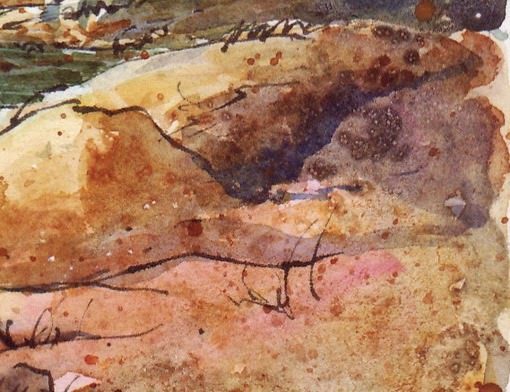 In the sample strip below, the first two mixtures of wet-in-wet color combined as expected then slid on the slick surface to one side of the puddle and dried, creating a darker area. The cobalt teal blue and viridian hue in the sample on the right stayed completely separate, even though both were very wet when I applied them side-by-side. Things aren't always predictable when painting on the Zeta surface with watercolor. I was able to achieve a dry brush stroke with a 1/2" flat brush, but not with a round brush. Hard edges are the norm with watercolors on Zeta paper. Softening them with water gives mixed results. With some paints or colors, it softens beautifully, like with the burnt umber on the right, above. With others, like the ultramarine blue on the left, the paint doesn't want to move much when water is applied to an edge. On the rose violet sample in the center, the water flowed back into the pink paint, causing a bloom, rather than the paint moving out into the clear water. 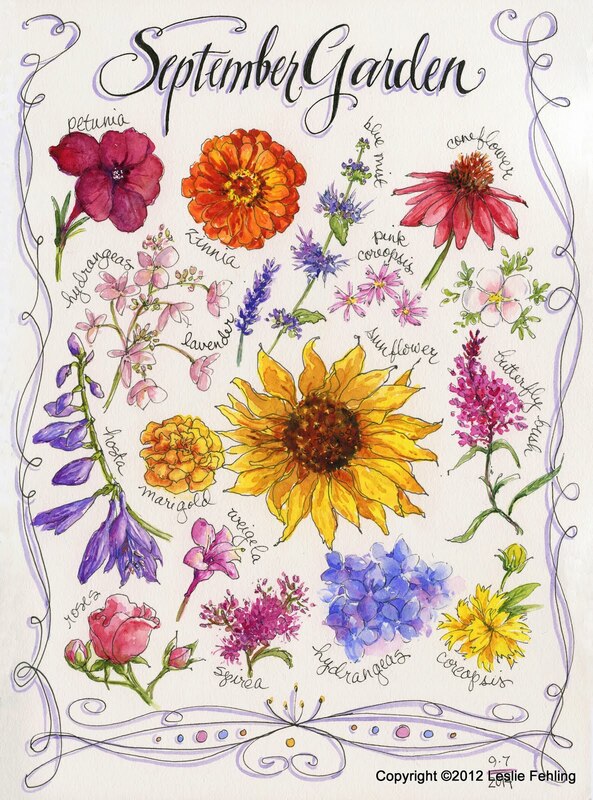 I usually like blooms in my watercolors, so that isn't a problem for me. 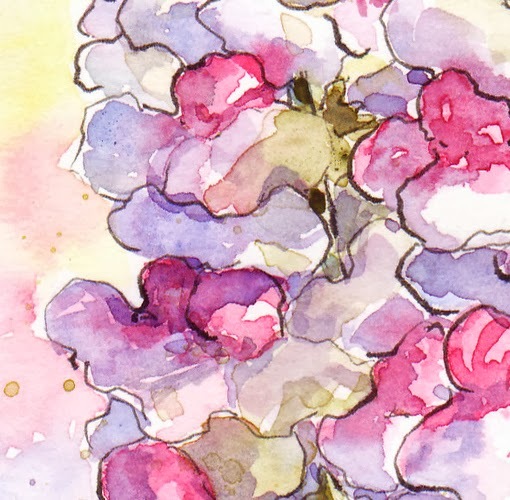 If you want control on the Zeta paper, it's best to paint drier, with hard edges. If you like spontaneity and "happy accidents," use lots of paint and water and let them do their thing. One place where Zeta excels is in its liftability. 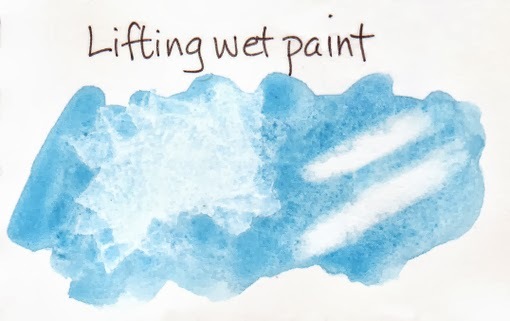 A dry tissue easily lifted off most of the wet cerulean blue paint on the left side of the sample below, and a damp brush brought back the bright white of the paper on the right. 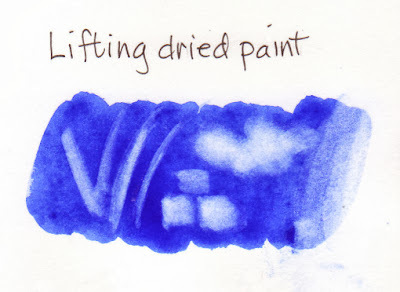 Dried paint is easily lifted, also. In the sample below, I used a dampened #4 round brush to lift the paint on the left side, then a 1/4" flat to lift the squares in the center and a dampened tissue to make the cloudlike shapes on the right. I also swiped across the right edge to show how you can soften an edge slightly after it's dried. 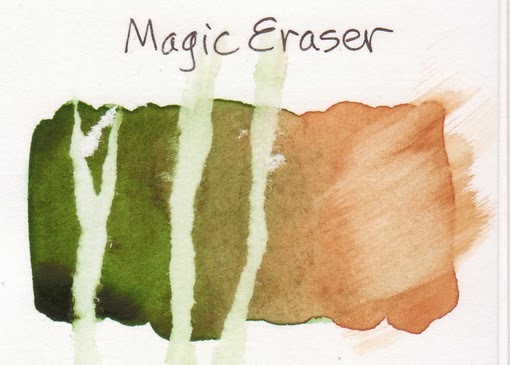 Watercolorists love Mr. Clean Magic Eraser pads for their ability to lift dried paint, and they perform as well on the Zeta paper as they do on traditional rag watercolor paper. For my sample, I first taped off the parts of the dried watercolor that I wanted to save, using painter's tape. Then I wiped across the paper with a damp Magic Eraser pad. The green paint lifted very well, but I had a little "oops!" moment when I started to lift the painter's tape before the paper had dried. The tape stuck to the paper and began to tear it. When I saw what was happening, I stopped peeling up the tape and waited for everything to dry completely, then peeled up the tape from the dry paper without any problems at all. The Magic Eraser also worked well at lightening the area on the right when I lightly stroked across it. 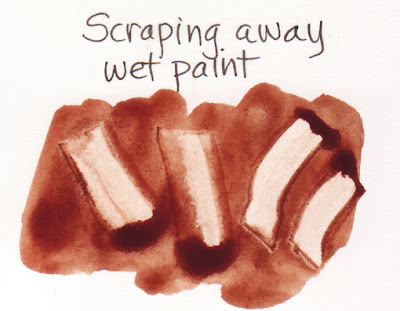 Scraping away wet paint with a tool is another way to recover the white of the paper. In the sample below I used a piece of plastic cut from an old credit card to scrape through the wet paint, pressing down firmly. The paint tended to seep back into the white area I had cleared away. I let the paint dry for a few minutes, then tried again on the right. The results were much better, with the paint scraping away cleanly on the smooth Zeta surface to reveal white paper. I used an Xacto knife with #11 blade to scratch lines into wet paint in the first section of the sample below, giving a grass-like effect. Next, I tried the end of a paper clip, giving a slightly heavier line. After the paint dried, I made the last two sets of lines by scratching across the page with the Xacto knife. 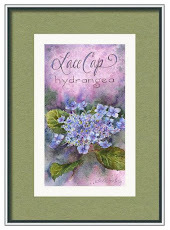 The vertical lines offer a great way to indicate light-colored weeds or branches on a dark background, while scraping horizontally across a page can add sparkling highlights to water. A really cool technique that I should remember to use more often is sprinkling salt into wet watercolor paint. I love the texture it gives, and I think the results are even more pronounced on the Zeta paper than they usually are on textured watercolor paper. Dropping clear water into wet or damp paint also gives a beautiful textured effect with amoeba-like shapes. Spritzing alcohol into wet paint on Zeta paper gives a similar effect, but the droplet marks usually tend to be more rounded. The surface feel of the Zeta sketchbook paper reminds me of hot press watercolor paper or Bristol paper, but whereas Bristol is not recommended for wet media, Zeta is made for multi-media use and performs beautifully with watercolor. It's fast becoming one of my favorite sketchbooks. 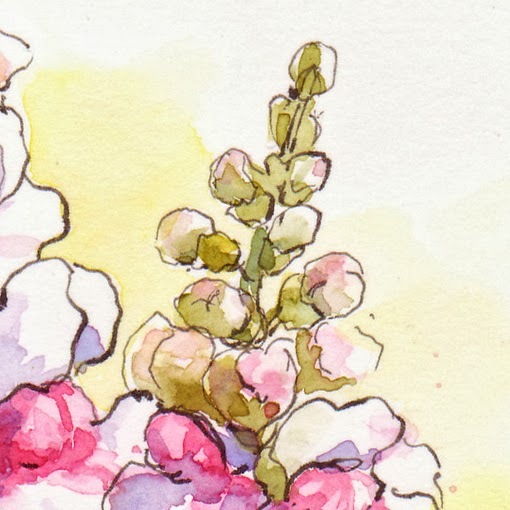 When the Stillman and Birn folks asked a few months ago if they could use my hydrangea sketch on the cover band of their new 7"x7" Zeta series sketchbook, I was elated. What a thrill to think that artists all over the world would be seeing my artwork on an exciting new product from one of my favorite companies! Ever since the sketchbooks came out, I've been wanting to take the time to play around with one of them, to see how my usual materials and techniques work on the smooth, bright white Zeta paper. So, I finally opened one up and started to play! My first sketch (above) was a little like a roller coaster ride...it had its ups and downs and lots of crazy turns along the way. 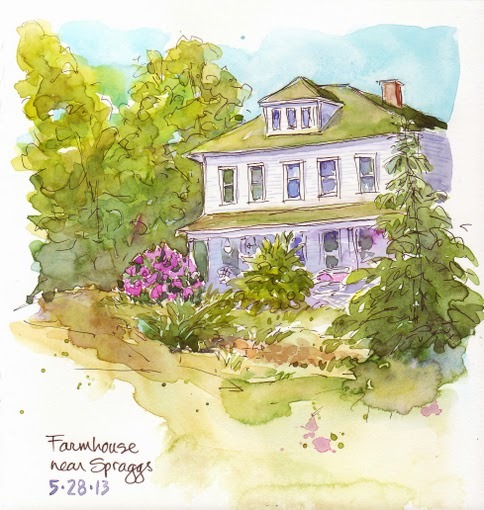 Drawing the sunlit farmhouse with a Pigma Micron pen was a breeze. The pen glided effortlessly across the smooth surface of the heavyweight 180-pound paper, and the drawing was finished in minutes. The watercolors proved a little more challenging, however. The paint tended to puddle on the paper without soaking in. Edges stayed hard, but when I attempted to soften them with a bit of water, the paint would flood into the newly dampened area, making a larger puddle. When I placed colors next to each other, they merged, blended and bloomed. Wet areas took a long time to dry, even though I was sitting in the hot sunshine. The internal and external sizing in the Zeta paper makes the ink and paint stay on the surface where all sorts of interesting things can happen. I'm an impatient sketcher, and initially I was taken aback at how long the paint took to dry, but I've found that I can use that to my advantage in ways that I didn't foresee during that first experience with the paper. The bright white paper is wonderful for showing clear, true colors. In this first sketch, it really helped accentuate the feeling of bright sunlight hitting the house. So, my initial reaction to the paper was, "Wow! That was a crazy ride! Let's do it again!" 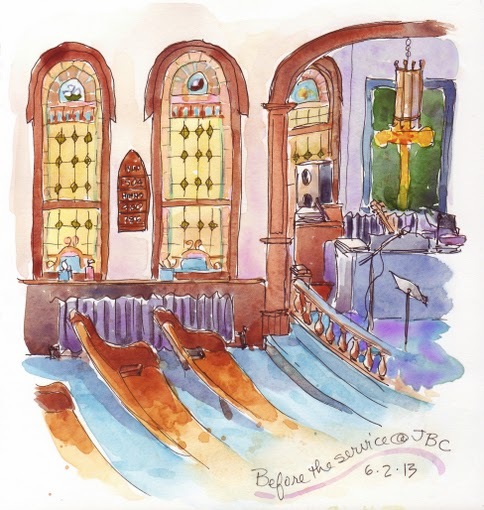 A few days later, I did this quickie sketch of our church sanctuary before everyone arrived on Sunday morning. I was learning to let the paint do its own thing in certain places, like the lavender and blue area on the center right. In other areas, I tried glazing/layering the paint, and found that I had to allow the under layer to dry completely before gently applying a second layer. Paint lifts easily on this paper, so layering has to be done with a light hand. 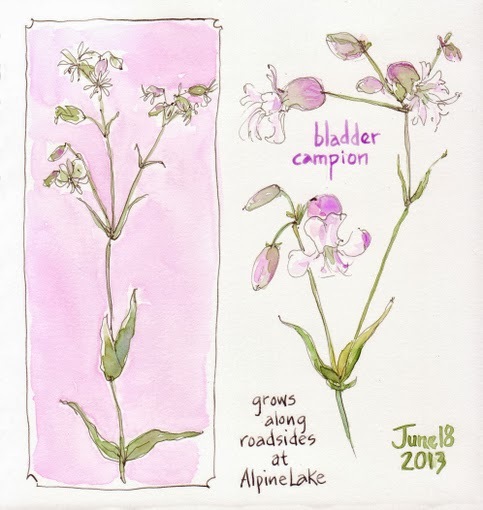 I tried out my Noodler's Creaper Flex Fountain Pen and Lexington Gray ink on this next sketch of a pretty wildflower with a not-so-pretty name, bladder campion. I found I had to rotate the pen and use the nib upside down to get the fine, delicate lines that I wanted for the flowers. On the Zeta paper, using the pen in the normal position gave me a heavy, wet line because the ink sat on top of the paper, rather than being absorbed. 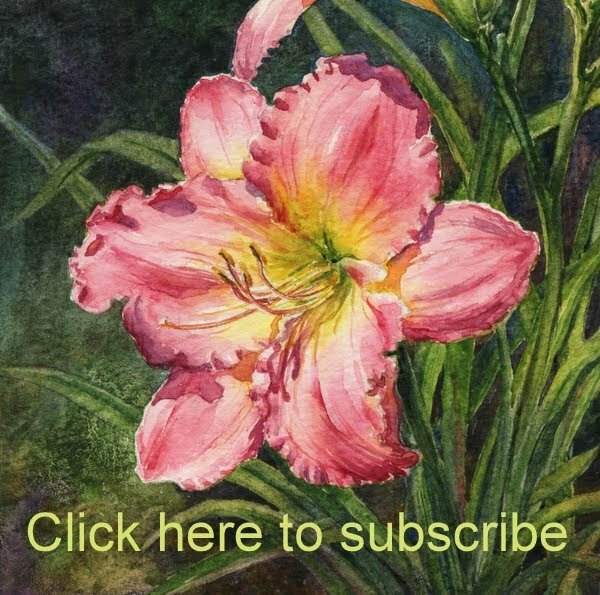 Filling in large areas, like the pink background behind the flower, requires using plenty of paint to get it to move around the paper. It's difficult to describe exactly how the paint behaves. It might sound silly, but the best way I can describe it is...it's grippy but slippy. The paper grabs the paint and edges remain hard, but when you get enough liquid on the paper, the paint slips and slides around. 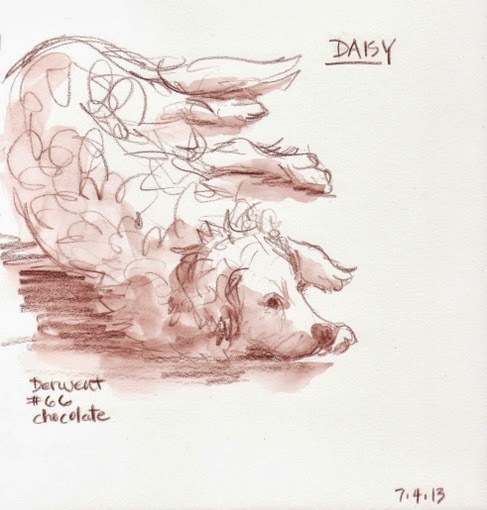 For the two-minute sketch of my daughter's golden retriever, Daisy (below), I selected a Derwent chocolate #66 watercolor pencil. The pencil felt almost buttery on the smooth Zeta paper. It's very different from the toothier surfaces of the Alpha and Beta series papers which I've been using for the past year. The pencil lines dissolved nicely when I brushed on water, but the resulting brown wash didn't flow much at all, and the edges didn't feather out. It's that "grippy" quality of the paper that keeps the water and/or paint in place. I tried out a couple of other Derwent watercolor pencils on the next page (#68 Blue Grey and #54 Burnt Umber) and really enjoyed the interaction of the pencil, water, and paper. Doing the monochromatic sketches was a nice change from my usual colorful work. I'd like to spend more time experimenting with watercolor pencils, trying darker lines, crosshatching, using more water, combining colors, etc. By this point, I was really enjoying playing in my new sketchbook. In so many of my other sketchbooks I'm focused on making beautiful finished pages, complete with text, borders, and detailed paintings. In this 7x7 Zeta, I gave myself permission to get back to just having fun. I was sketching quickly and learning to let the paint do its own thing. These little experiments were teaching me to lighten up and loosen up. 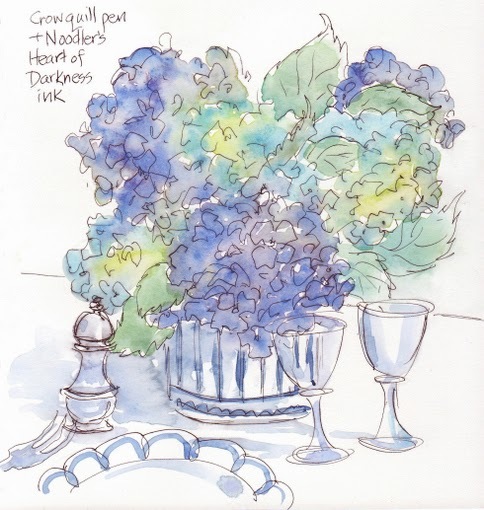 For the hydrangea sketch above, I dug out my old crow quill pen from my college days. Its sharp, pointy nib, which often snags on rougher paper, moved effortlessly across the plate-like surface of the Zeta paper. I drew carelessly, freely, instinctively. It was so much fun! I splashed on watercolor and allowed it to mingle and flow. The Noodler's Heart of Darkness ink that I used is waterproof when dry, but when I began adding paint before some of the heavier lines had dried completely, it softened them in places. I had originally planned to go back in and add more details to the flowers to define the blossoms a bit, but in the end decided to leave things loose and undefined. A water-soluble Precise V5 Rolling Ball pen was the next tool I tried in my new Zeta book. 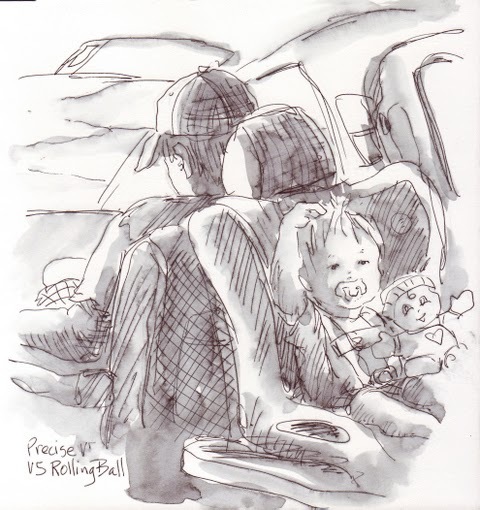 I sketched my sleepy grandson from the back seat of the van (below) as we headed off to a 4th of July picnic. (Clutching his toy, binky in place, twirling his hair - he's all set for a nap.) The pen rolled smoothly and freely over the paper, but because the ink sits on the surface and takes awhile to dry, I had to be careful not to smear my lines as I drew. In the end, it really didn't matter though, since I dissolved them when I applied water to wash in the shadows. The permanent Sharpie Ultra Fine Point pen used in the sketch below dried quickly on the Zeta paper. Drying time wasn't an issue at all, and the ink lines didn't budge when I watercolored over them. I used a Niji waterbrush to apply the color, and had to continually squeeze the barrel to push more water onto the paper and allow the paint to flow. You have to keep things juicy on this paper. This picture strayed far from my usual style, but there's something about the Zeta paper that makes me want to paint splashy and bold. The heavyweight paper curls a bit when it's flooded with water but never ripples or buckles. When dry, a slight curve sometimes remains but flattens out in a closed sketchbook. None of the materials I've used so far has caused any show-through on the back side of the paper, a nice feature which allows you to use both sides of a sheet. Pencil lines erase cleanly with a kneaded eraser or click eraser with no noticeable change in the paper surface. Marker lines stay crisp and sharp with no bleeding or feathering. 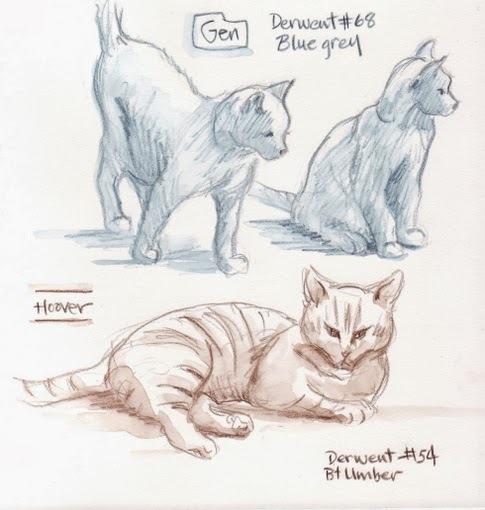 Join me tomorrow for PART 2 of my Zeta review when I'll be sharing a variety of watercolor techniques and how they behave on the smooth, heavily sized surface of the Zeta sketchbook paper.